Who’s heard of the FEED ? I’ve seen them out there catering for this and that, I’ve always liked their food. Until 6 months or so ago they were on the market making yummy Rubin’s and the like with a free bag of kettle crisps, all served in scrumptious ciabattas. Along with a hot dish of the day often vegetarian and soooooooo tasty. After searching last Sunday for a VIP chip van to no avail (but that’s another story) we stumbled upon The Feed’s new café on Prince of Wales Road. It has that original Feed vibe, natural wood, a touch of orange with modern lines. This is a café with 6 or so tables, counter service with a good lunch time menu. You can choose your filling, then choose your bread – we had a massive bag of Kettle crisps on the side and some good tea. Sandwiches start from £2.50 – I had a chicken coronation wrap with corn for around £3.50 – – that’s cheap right! freshly made, served with some rocket on a proper plate, siting at a nice table on a comfy chair for £3.50. I got chatting to the server, she was enormously passionate about what the Feed do, showed me around the kitchen and told me about a canape event they were having the next week. 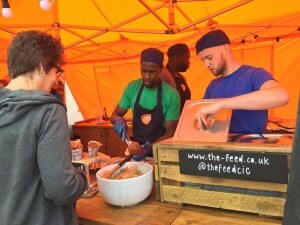 ‘The Feed’ started life as ‘Leap’ a charity organisation funded by the lottery as an enterprise scheme but like all good things it came to an end. Self-funded it soon became known as the Feed and full circle on they have got the Charity CiC status back. Now, The Feed is all under one roof – café, training kitchen, office space and class room. Find it at 78-80 Prince of Wales Road, Norwich, Nr11NJ. Park for free at riverside for 2 hours, or it’s metred just across the road (in front of Tesco) or it’s just a short 10-minute walk from the city centre. Rose lane is the largest closest car park – so no excuse there! Anyway Basically, The Feed run a 4-week training course for people who need a bridge to employment. May be homeless, X offenders, venerable adults along with all sorts of people who just need help getting the confidence and experience to get back in to work. It’s not just about catering the course motivates and gives you the skill set to get in to work as well as practical skills. Courses run Monday to Thursday for 4 weeks, then they get offered 4 weeks work in the café both front and back of house. Week one – is foundation learning, mixed with hygiene and hands on skills. Week two – is more practical with a Kettle crisp show round, along with a make your own flavour section. Week three – is customer service based and includes a trip to Green Farm, for Barrister skills. Green farm supply all the coffee for the café. Week four – brings it all together along with info on finances and managing money. They take up to 7 learners on each programme – with an amazing success rate. The Feed is Kettle crisps main charity not only do they help with the factory show rounds, but they also supply crisps and Norfolk potatoes (jackets) for the café along with offering work schemes for some of the learners. For breakfast (bacon butties from £2.50) or Lunch, they’ll also be adding a hot dish of the day to their menu, like they had on their market stall. Plus, of course it’s all made on the premises. They also offer an amazing ‘outside cateringservice’ with local delivery from only £3. A 16-strongcanapéselection to choose from all presented in good looking (no plastic) trays which are ready to serve. Gluten free, vegetarian and vegan are all in the line-up. Starting at £4.75 for 5 per head plus vat for a minimum of 10 guests. Sandwich plattersstart from £3.95 per person, minimum 6 people to more exotic flavours for £6.50, minimum 8 people plus vat. plus, you can add extras like Kettle crisps, refreshments, plates and napkins from 20p-£1 per person per item. As if that wasn’t enough they also offer Breakfastoptions from £1.50 – £3 per person including fresh fruit salad, bacon paninis, home-made granola and yogurt along with pastries. The food quality is amazing, tastes are sublime and presentation is key – packaged well, brilliant prices AND cheap delivery – – why wouldn’t you, plus your helping a great local charity. You can also help by eating crisps! – 150g Kettle Bacon and Maple sauce flavour to be precise – Kettle are donating money to the Feed from each bag sold – – and that’s Nationwide too, up until the end of 2020. Look for the Feed label. So yet again Norwich have an amazing cause, a worth-while charity and for me it’s all about getting people back in to work, more caterers, local employment, great transferable skills, more tasty food and feeding that passion to cater.